South Austin has remained a popular place for buyers over the last several years, and that popularity will likely remain forever. If you are looking north of the 290 in south Austin, the latest statistics put the average sales price in the mid/high $400k range for a single family home. That prices out most first-time buyers and many others too. However, if you go south of the 290, you can find a home still priced in the mid-$200s. 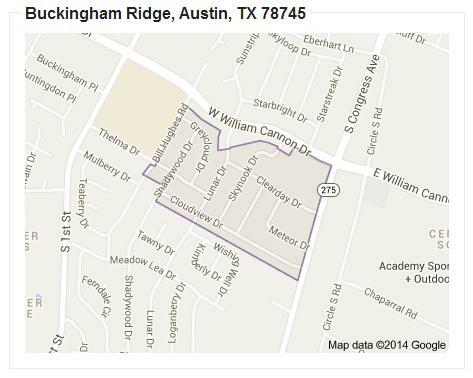 Our featured south Austin community is Buckingham Ridge – a small, non-HOA community nestled between South 1st and South Congress, with William Cannon at its north border. Our buyers love this little community for two main reasons: its proximity to the hot spots on South 1st/South Congress and because they can still afford a home under the $250,000 range. As mentioned above, there is no monthly HOA fee, and in addition to that, the tax rate is a reasonable 2.46%. The homes in Buckingham Ridge were primarily built in the late 1970’s – so you get a lot of that character and charm South Austinites love! And, as expected from an older community, it is abundant with mature shade trees. Whether you are looking for a home to remodel and add your own touches or a home that has recently been renovated with a modern twist, you are sure to find a home in this south Austin community! To learn more about the homes for sale in Buckingham Ridge, or other surrounding south Austin communities, contact us today! Bella Colinas – Neighborhood Review, Available Homes and More!